Although guitarist Earl Carter might be unknown, he has already played on many projects. He performed for example on Bobby Lyle's "Straight and Smooth", on Marcus Johnson's Live - In Person – DVD, Live @ Blues Alley and Just Doing What I Do, Jaared's Hangtime, Alyson Williams' It's About Time and Spike Lee's soundtrack to Do The Right Thing. Earl performs in multiple genres of music including R&B, neo soul, contemporary jazz, reggae, alternative rock, pop, hip hop, gospel, house, etc. 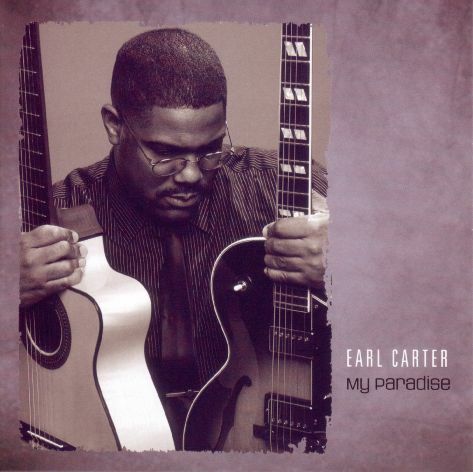 After No Frettin' (2002) and 495 (2005) My Paradise (2007) is Earl Carter's third solo album. His passion is still guitar featured contemporary jazz and you have to be a fan of this genre to really get access to his new album. On the other hand Earl Carter is experienced enough to make his work accessible. Earl is performing guitar, bass and on most of the tracks also keyboards and programming. He is supported by Mike Corbett (drums, keyboards, programming, bass synth). Acid Intro is not acid jazz but a cjazz shuffle. Something we already heard from DTTB's laboratory. On Jammin' At The Alley Earl plays chords in the style of George Benson on a funky background of wah-wah rhythm guitars. Adding melody lines using the overdubbing feature he creates a song rising like a phoenix from the ashes. My Paradise is Earl's new heart child. He performed all instruments on this tune of timeless simplicity. Latin Fever has a burning Spanish flavor. Earl Carter builds on a main melody his diverse solos. Improvising is Earl's great passion. For those who await less guitar solos but a constant melody Ear Carter presents My Boo. This song as single could be more popular than My Paradise. Happy Anniversary is Earl's birthday present featuring singer Annie Sidley. Annie has proven herself an accomplished composer as well as one of the most dynamic and charming R&B/Pop performers today. She and her band tour nationally and have shared the stage with Joan Jett, WAR, Chuck Brown, Paul Taylor, Joyce Cooling and Kenny Wayne Shepherd. Her current album is Diamond in the Sand (2006). Walking through the forest during the Indian Summers is a special pleasure. Earl Carter catches this moment in his tune full of emotions. More sentiments do you find in the interlude Come With Me. This song is featuring singer Josh Stepherson and Sharli McQueen. Sharli's 2004 debut album “Strong Young Girl” had success in the R&B/Pop music landscape. The Head Bopper was written by Mike Corbett. A slow tune with a curious keyboards intervention. In Your Mind is the second song featuring Josh and Sharli in a duet. Nevertheless Earl's guitar stands in the foreground while the singer are reduced to background singers. The constant bass drum rhythm is of a simple structure. I suggest to enjoy Earl's brilliant guitar performance. Smooth Ride Home has an infective melody line and convincing guitar licks. A Horse With No Name was composed by guitarist Dewey Bunnell of the group America for their stellar debut album America (1972). By using an acoustic guitar Earl Carter's approach reaches a reasonable similarity. Miles Davis is the god of jazz. Hundreds of artists are inspired by his genius. Earl Carter's tribute to Miles Davis is called A Taste Of Miles. Earl Carter and Mike Corbett had so much fun performing this tune, that Earl added a further Postlude to his album. Earl Carter's new album My Paradise has some great moments. Especially friends of guitar music will enjoy this album. On the other hand I miss more involvement of additional musicians. A Taste Of Miles is a good run-up for this valuable improvement.